CMMS training is important especially with a full-featured CMMS software product. Our free educational resources include videos, documents, online personalized training, offsite and onsite training. In order to realize a good ROI on your maintenance management software investment CMMS training is advisable. Additionally, we offer multiple formats and levels of CMMS education. We have been successfully training maintenance managers, maintenance planners and maintenance teams for over 21 years. Without doubt, maintenance teams that receive training come up to speed with the software faster. Besides this, they get the set-up right the first time. 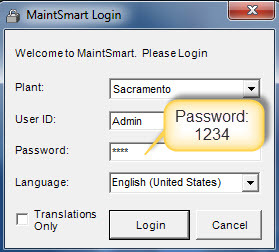 This leads to better buy-in by the rank and file CMMS users and well and other non-maintenance management users. We provide at least two hours of free training with any purchase of our software. Furthermore, trial users have unlimited access to consulting, training, webinars and more. For example, below is a small sample of some suggested two (2) hour training sessions. These are not canned courses but are personalized CMMS education targeted to the students' particular request. Contact us for a full listing of our training agenda. Free CMMS education is great for maintaining your skills and staying current with the CMMS software. Moreover, new videos and documents are available on a regular basis. Below are free CMMS training videos and several documents that may be useful in you understanding of the software. Contact our office below for a free personalized online demonstration and consultation. Online CMMS training is our default CMMS education method. Moreover, this training is always personalized to what your organization needs. Best of all, our trainers are maintenance managers and software engineers. As such, our instructors are experts with CMMS and their application in an equipment maintenance setting. These online training sessions are typically 1-2 hours in length and may accommodate up to 25 students per session. Furthermore, we'll even use your data or help you set up you company then provide the data for you to go live with. Onsite training is gradually being replaced by online training. That being said, onsite training is still available and in many cases appropriate. The costs for onsite instruction are generally somewhat higher than online instruction because of associated travel expenses. Additionally, online training may be cancelled at the last minute without penalty. Due to the fact that the software is translatable into any language, our onsite training has taken us all over the world. Currently our software is used in 42 countries. As such, we have resellers in several countries that also offer expert training services. Lastly, offsite training is available at our facility in North Bend, Oregon, U.S.A. Check out these CMMS training videos that cover a wide range of topics. Additionally, see our main software training page for more training videos. Beside the training page our blog is updated weekly with at least one new useful topic. Learn how to use configure user group permissions. Linking Parts to Preventive Maintenance Tasks. 1.) How should our maintenance management operation set-up the equipment hierarchy? 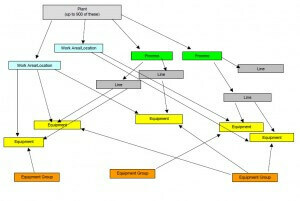 The equipment hierarchy was designed to fit any equipment maintenance system. 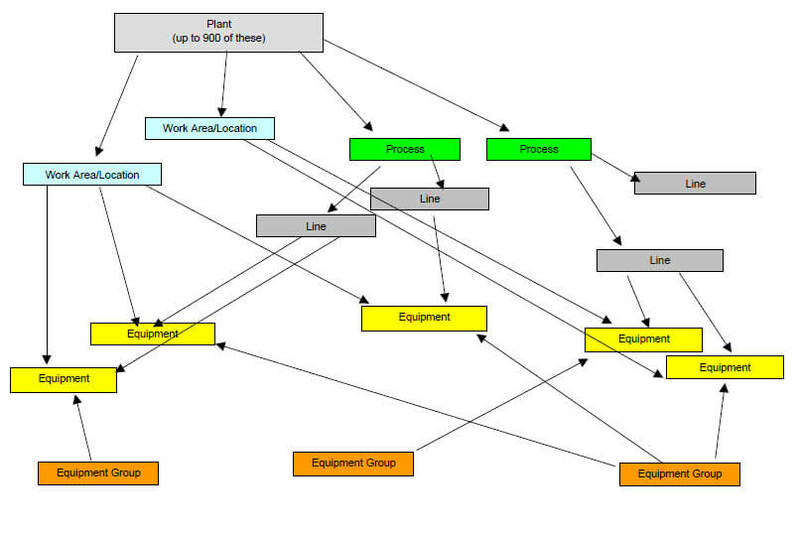 To clarify, the equipment hierarchy is really nothing more than a way to group your equipment. What makes this equipment hierarchy different from all other CMMS software is that it is a three-dimensional hierarchy rather than a simple linear hierarchy. This grouping normally matches the company geographical location(s) and functional location(s). Most importantly, these hierarchy levels are user-defined and should match your layout of equipment. Subsequently use these levels (groupings) to filter and analyzing your equipment for optimization and maintenance reporting purposes. For example, below is a manufacturing plant maintenance operation where the top-level of the hierarchy is named "Plant". Note: there may be up to 999 top-levels in a database. In other words, identify up to 999 different plants (or other user-defined locations) in a single database. Accordingly, it is now possible to compare, side by side, each of these manufacturing plants to one another since they are located together in the same database. That being said, each manufacturing plant is autonomous containing its own specific data. Additionally, basic users log into their own plant and only see data from their own plant. 2.) What is the different between equipment descriptors and equipment items? Equipment descriptors are NOT the actual physical equipment items. Equipment descriptors are used to help the user quickly, accurately and consistently create the actual equipment items. The equipment items are the actual physical equipment that all work, parts, etc. reference in the CMMS database. Equipment items are at the bottom of the equipment hierarchy and all data in the program points back to the equipment item. This makes perfect sense because a CMMS is an equipment maintenance program. See this CMMS training document on equipment configuration or better yet contact us for a personalized demonstration of how your equipment could be set-up in MaintSmart. Get Your Free Consultation, Personalized Demonstration and More!